It's time for another Color Throwdown! Barbara is our hostess this week. She's got a classic neutral combination with a pop of bold color that's perfect for seasonal designs--red, gray, and black. I used the colors to make a clean and simple holiday design. I stamped the "peace on Earth" sentiment from Avery Elle's Snowflakes stamp set in red ink on a white cardstock panel. To go with the sentiment, I stamped three different sized snowflake images from the set in gray ink, then cut them out with the coordinating dies. I arranged them above the sentiment, using foam tape to secure them, then dotted the center of each flake with a clear crystal. I adhered a panel of gray cardstock beneath the sentiment, then added a narrow strip of black cardstock at the top edge to set it off from the sentiment. The finished panel was adhered to a red card base. To play along, just create a paper crafted project using these colors as a starting point and add a direct link to your finished project using the linky tool found at the end of this week's CTD post. As always, if you don’t have exact color matches, something close works just fine. Just be sure that the challenge colors are the dominant ones in your project. And, if you upload your project to an online gallery, use the keyword CTD472. 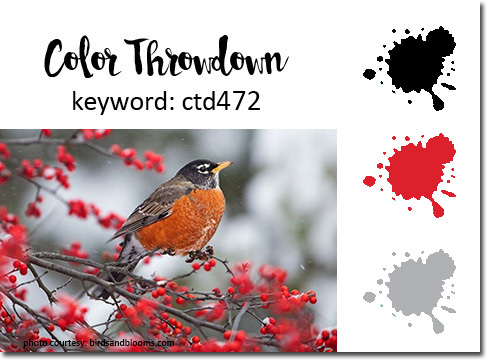 If you upload your projects on social media, go ahead and use the hashtag #ctd472 and #colorthrowdown. You can find us on Instagram (and on Facebook!) with the username colorthrowdown. Before you get started, here’s some inspiration from the talented Color Throwdown team and our December guestie Debra James, and this week's Guest Star Stamper, Kathy Straw. 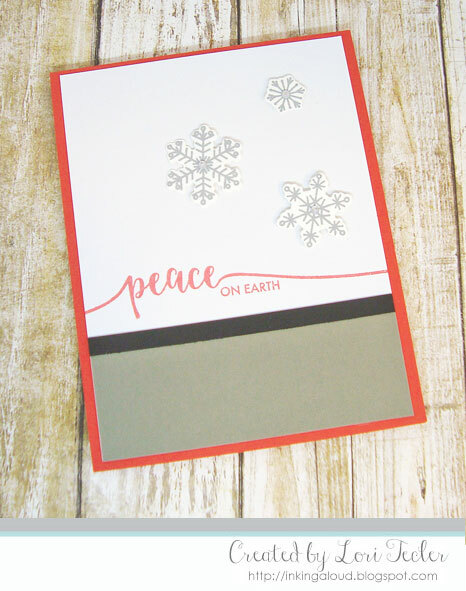 Love the simplicity of your card and your use of the color palette!